As the Frankenstorm began its way up the coast of Florida, the skies turned gray. The wind whipped up ocean waves. People were shooed off the beach. But football fans paid the weather no mind. There was partying in RV City to be done. Johnson predicted there would be several downed trees in our neighborhood. Not willing to take even the smallest chance of possible damage, Sweetie parked the Lincoln which had just come home from the repair shop on the side of the house that has no trees anywhere around. That side of the house also has no driveway. I sent up some prayers of gratitude for having the foresight to cut our big oaks down. The yard looks barren, but I didn't have to worry about a tree falling on the roof. Maybe we were just too far inland, or maybe the storm lacked the ferocity that was predicted. There was enough wind to make the flags stand out straight, but I don't think the trees were in danger. "Let's grab a blanket and lay on the grass and look up," suggested Sweetie. And so we did. The cloud cover made it so we couldn't see much of anything. But I noticed how small leaves danced across the breeze, with twists and turns and arabesques, like ballerinas. Some swayed gently back and forth, while others seemed to take a nosedive straight down. I thought about letting go. I wondered how after they have served their purpose, the leaves let go and flutter to the ground. Or does the tree release them, with a soft kiss and note of thanks? There's a difference, isn't there in letting go and being let go. A subtle yet significant difference. May you feel the breeze on your cheek, and hear the whisper of the One who says, "go, Child, go. Be all you can be." Remember when you were a kid and you added half a year to your age to make you sound older. I noticed on a recent visit to the ER with a friend. I'm 91 and a half she told the intake person. I think when you've lived to be in your 90s you can add whatever you want! I'm over 60 and a half. Next Tuesday is the 11th anniversary of my mother's death. I can't tell you why but I miss her like crazy today. I feel like I'm about 2. You know how toddlers are shy and they stand behind their mom's legs, holding on tight to her pants of skirt and peek around to see. I had that vision of myself last night. Then I remembered mom isn't there to hold on to. Talk about being sad and scared. So for today while I'm feeling sad, I'm letting Little Mary cry whenever she wants. I'm listening to Linda Ronstadt sing me lullabies. I'm eating sour cream and chive potato chips. I'm sharing this on my blog. I wasn't going to. Seems I've written too much about my grief. Then I figured no point in censoring myself no. And I'm sewing. A baby quilt. For the little boy who is going to join our family in December. It keeps my hands and mind occupied. Sweetie just walked in and is all worried about me. Hmm Alana didn't tell me how to keep someone from worrying. Since I'm the Queen of worrying I know how it feels. I'm sorry he's worried. Guess I'd feel the same way if I saw him in a puddle ocean of tears. I think it's time for a scary movie. and I am Jeanne, the woman who flat-out loves her. Hey look everybody! Wholly Jeanne featured ME as one of her envoys to get the word out about the art project she's doing with her develomentally challenged sister-in-law, Nancy. Check it out, here. First Nancy draws (in her favorite color purple) then Jeanne embroiders the design on small white cloths. Art, I think, is in the eye of the beholder. In Nancy's case, there is no filter. Her designs are free from personal critique. When you see them you can almost feel her joie de vivre. And I've got to say that as anxious as I felt at times in Seattle, when I was photographing drawing #113 it kind of took me out of my scared self. "Listen, Sugar: DO NOT TOUCH THAT WRITING SPACE OF YOURS. 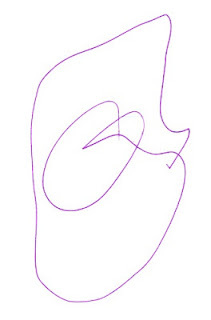 If you can write like this from a table shared with a sewing machine or a closet where you've carved out enough space for your computer, you can write anywhere. So don't waste your time with that kind of stuff, just write. Oh my god, woman. You had me shedding tears of nostalgia, tears of sadness, and tears from laughter. You've got just the right mix of detail to ground it and let me settle in before getting to the heart - not the heart of the story, but the heart of me." I'm laughing cause in some of our earliest exchanges Jeanne promised to help me clean up my writing space. She gave me several assignments to sort of clear out my head first. All of which I promptly put in a pile and forgot about. Then I moved from the messy office to my chair in the den, which I can now rightly call son (daughter?) of messy office. Jeanne has also encouraged me to keep sewing, to turn some ideas into a small business, to remember my family's history by keeping records in the form of stories and to save room for serendipity. Sometimes she uses words. Mostly she blazes a trail and invites others to come along with her on the journey. Thanks Jeanne, I'm honored to be one of your envoys. Wishing for you a sunny smile and someone to call you "Sugar"
In the ordinary-ness of an autumn afternoon, I sat in the car listening to a BBC program aired on NPR. The radio was a buzz with the story of Malala. Since I tuned in late, I didn't know what they were talking about. Only that something horrific had happened to a young girl who has been blogging about schools for girls in Pakistan since she was 11. Malala. Probably in the Pakistani language that name has some special meaning. I love the sound of it. 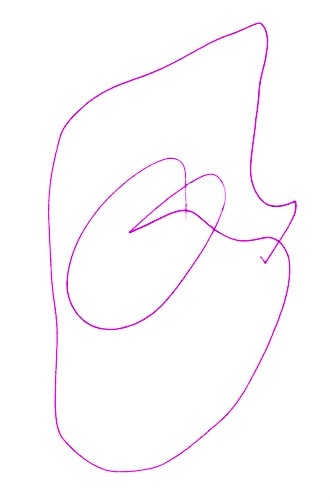 It reminds me of a bird song, or maybe a fruit bearing tree. Now that I know the tragic story, how she and two others were gunned down by the Taliban and left for dead, I wonder if Malala might mean brave or beautiful. For that is certainly how I see her. In church last night I sent up prayers to Divine One for Malala's complete recovery. But more than that, I prayed for all women and girls who are denied basic human rights and live in fear. And especially ones, like Malala, who step out of their fear to say "enough is enough." Today, October 11 is the first International Day of the Girl. Robert Walker of the Huffington Post wrote of the plight of Malala and other girls in an article today. On this day, October 11, when the UN and the world observe the first International Day of the Girl, we have a chilling reminder of just how far we have to go before girls achieve true gender equality. Malala Yousufzai, a 14-year-old Pakistani girl who was shot in the head by the Taliban for daring to advocate for the education of girls, is fighting for her life in a Peshawar military hospital. While hopes are high that she will survive, she remains in critical condition. As tragic as the shooting of Malala Yousufzai was, we must turn our collective outrage into constructive action. On this day, the first International Day of the Girl, let us all resolve to turn her personal tragedy into a global rallying cry for girls, their education, and their right to pursue their own hopes and dreams, free from the tyranny of gender inequality. For the entire article go here. When a problem is this big I feel especially small. I want to do something, but can't imagine that anything I could do would make a difference. 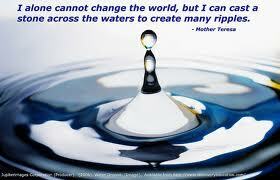 And that's when I'm reminded of this quote by Mother Theresa - a small woman who made big ripples wherever she went. Please stay tuned. And please add your prayers for Malala's full recovery. Wishing for you a world where women are no longer afraid. There's been a new twist in my emotional roller coaster - anxiety. It feels like when you are slow chugging up the slope, you know what's coming and your body is preparing to be lurched forward in a death defying downhill run. Every nerve is on edge. Your brain is sending adrenaline throughout the body, your eyes are looking for anyway out, you're so scared you think jumping from a moving train might be better than the fall. My doctor today called it being on "hyper alert." Our mind/body's way of protecting us from saber tooth tigers. Some people are thrilled by an adrenaline rush. It makes me want to puke. It's not the first time I've felt like this. But I don't remember it lasting quite as long. Before seeing my doc, I looked through a notebook I keep in my purse. I found some notes I took at the beginning of the year at a John Edwards (of psychic fame) show. "The first year of grief," he said, "is the coasting year." It's the second year that is really hard for the griever because they have to deal with the loss of their support as well as the loss of the person. Actually, in our society, a year is on the long side. Unlike other cultures where wailing and carrying on is expected, and professional "wailers" are hired, people in the western civilizations are expected to "get back to normal" go back to work, carry on like nothing every happened. In other words, pack that grief up in a nice little box, tie a bow on it you want, but put it up in the attic where the others memories are kept. The fact that I have not had a job to go to is a luxury I'm not ashamed to admit to. At the same time, I think maybe if I had another something(s) to keep my mind occupied, I wouldn't be so sad all the time. And maybe, it's like Alana has told me, grief is like a spiral and some unknown force seems to know when it is time for the spiral to turn and grief to rise up another notch. That's where I am today. Ever since the trees fell, I seem to be waiting for the next catastrophe. I can't see around the corner, but my body is pretty sure there's a boogie man there. I don't think I want to change my medications, so I'm going to rely on the self-care things I'm learning. It is time to be still, to go to a quiet place in my "heart center" and breathe. If there's a wildebeast in your vicinity, I wish for you swift flight. But if beast is of your own making, I wish for you a calm, quiet, gentle heart beat.